Like all of Wellington, my heart warms when I see the pohutukawa in bloom. The dark-red masses of fringed flower radiant against the silver-sage foilage and epically twisted branches. Vividly silhouetted against the pure blue summer sky, or adding a moody glow to mist and rain. Most poignant of all, the soft, ephemeral pools of shed pohutukawa fringe-petals underneath the trees, turning the deep, cool shade a tender crimson. Photo courtesy of Velvet Android via Creative Commons attribution license. In tribute to the red of summer’s heart, children draw smeary crayon tributes, office mates discuss it around the cappucino extractor, and we dress up as it for the Sevens. Photo courtesy of Lazellion via Creative Commons attribution license. 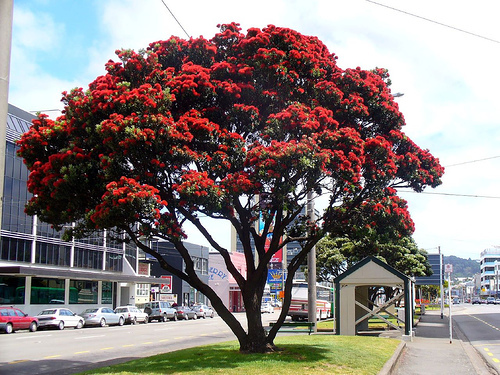 It’s a perplexing pity, then, that the pohutukawa, while a New Zealand tree, is not technically native to this region, and that it’s not included in future street plantings. Its excessive enthusiasm for cracking sidewalks and entering sewage lines has vexed more cities than ours. Instead, what is encouraged is planting the northern rata, pohutukawa’s cousin, which is native to this region. Northern rata also grows to 30 meters high. DOC and WCC stop short of recommending it for street plantings or your side garden. And who dressed up as a northern rata for the Sevens? As long as there are heedless garden centres and pohutukawa varietals that pretend to behave on their garden centre labels, the pohutukawa will burst pipes with its beauty throughout the region for years to come. Majestic and (to me) alien. Do you have dogwoods also? Nope, no native dogwoods in NZ and the dogwoods imported for parks/gardens come from China. Last time I was in San Francisco, their pohutukawas were in bloom…I was surprised!